This is a family favorite. It is so simple and just makes for such a delicious meal! I got this recipe from Allrecipes.com and probably use this about 2 times a month. 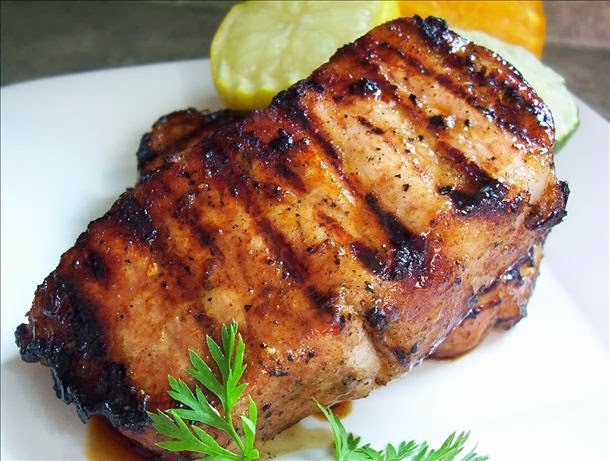 Whenever we have pork chops…this is our marinade! I usually get a big pack of pork chops at Costco and make enough marinade to freeze the other half of the chops. Combine the ingredients together add pork and turn to coat. Seal in large zip-lock bag and freeze or use after 30 minutes of soaking. Drain and discard marinade. Grill, covered, over medium heat turning occasionally. We serve this with a salad or steamed veggies and brown rice or quinoa…this is perfect with a glass of wine too! Yummm! I have used the recipe several times, it is so delicious! My family loves it and quickly became a favorite. Awesome! I'm so happy! This is our "go-to" for sure too!